Views / Location / Sunlight / Space / Design / Comfort / Countrywide Tours !!! 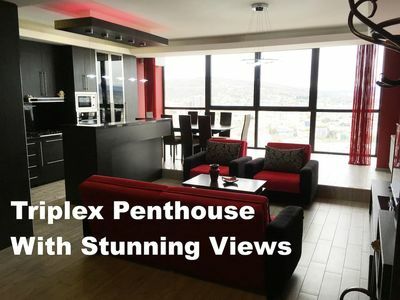 Fully separate guest floor, panoramic, floor to ceiling windows and absolutely unique, SPECTACULAR city views (you can even see the Caucasus mountain range 70 miles away). 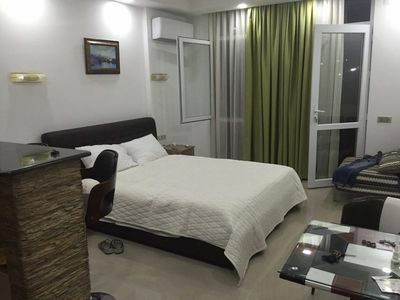 4 comfortable bedrooms and the large terrace are cozily retreated to the second and third floors. 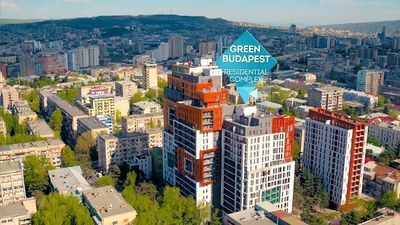 You are in the very heart of the city, steps away from Pekini Ave and Holiday Inn Tbilisi, BUT in the high-rise with the best natural air ecology. Total space - 2000 SF. Separate guest floor perfect for partying and entertainment - 690 SF. Guest floor panoramic windows are retractable and convert to french balcony, very convenient for smokers. Private, open terrace with breathtaking views. Fully equipped open kitchen with the bar stand and all possible appliances. Easy-care kitchen surface with antimicrobial black quartz countertops. Stainless steel double fridge with bottom freezers (total capacity of 26 cubic feet). 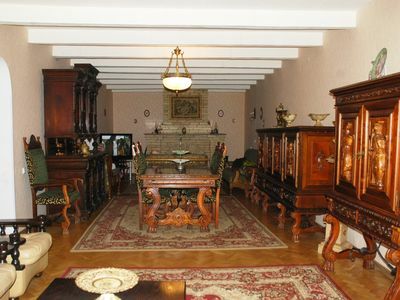 Very quiet and comfortable bedrooms with comfortable mattresses in each. 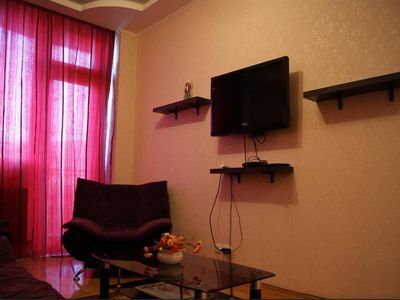 12 beds total in the apartment (16 people can be accommodated), every bed is comfortable. Plenty of closet space and workspace + extra storage room in each bedroom. Bathroom on every floor - 2 full bathrooms with showers + 1 half bathroom without a shower. Every toilet seat is equipped with the hygiene shower gun (shattaf bidet spray) for maximum comfort. Separate Washer & Dryer compartment with a ventilation. Lightning fast fiber optic internet with WiFi. Ethernet wiring in every room. 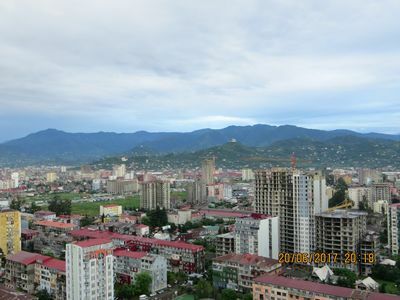 Cable TV with ample choice of tv programs and movies (English and Russian language including). 60” LED TV in the living room. 30” LED TV in the master bedroom. One of the very few ecologically clean spots (free of carbon monoxide pollution) in the entire city center. Ikalto HIll is steps away from Pekini Ave, one of the major avenues of the city with plenty of dining and shopping choices. Tbilisi Zoo - 1250 meters / 13 minutes walking. All types of public transportation are available. Bus station right at the building (15 min ride to Rustaveli Avenue). Subway station 4 minutes away down the hill. Plenty of cabs on Pekini Avenue, all day around ("on call taxi" shows up in 5 min, about $2 per ride). 24/7 driver is provided with 12 hour notice. Professional tour guide is provided for a very competitive price. Please email us in advance to schedule countrywide tours. Airport transfer is provided for $20.